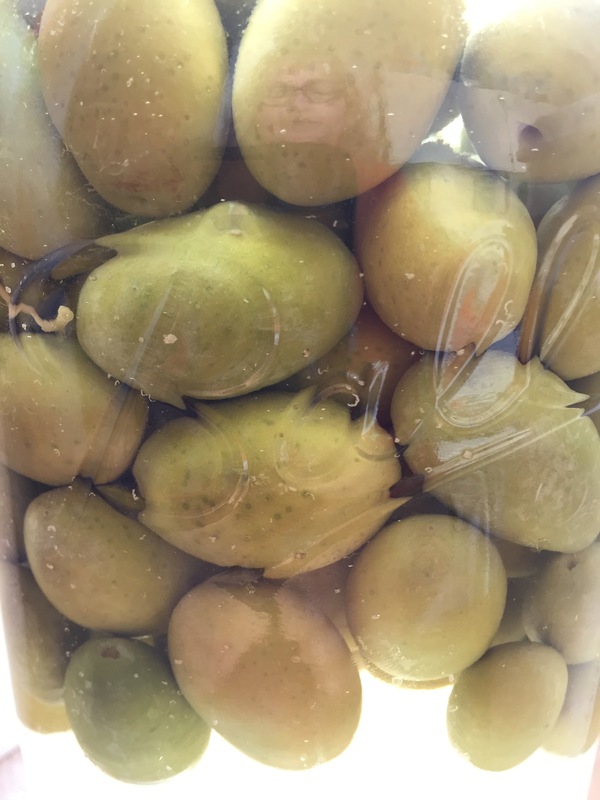 In November, 2017, I gave a workshop at Preserved Oakland on curing, marinating, and serving the unripe olives commonly grown in Northern California’s San Francisco Bay Area. I’m working on a self-published zine (along with amazing artist and graphic designer Arin Fishkin) with lots more specific details on method, sourcing olives, and more; it should be ready for the 2018 olive season in October. For those who attended the class, these guidelines are for you. And if you want to be kept informed of the zine, join my mailing list or leave your email addy in the comments. The fastest method, but not the best flavor. With a paring knife, make two slits down the length of each olive. While you’re handling the olives, discard any that are bruised or misshapen. Drop the olives into water as you work. Cover the olives with fresh water by 2 inches. Weight the olives to keep them all submerged in the water. Change the water daily, even twice daily, for about 4-6 weeks to rid the fruit of its bitterness. Keep the olives in a cool place. Once you like its flavor, cover the olives in a brine of 4 cups water to 1/4 cup kosher salt and 1 cup vinegar. Feel free to add other flavoring agents to your olives, such as garlic, chiles, dried herbs, or citrus zest. Again, weight the olives to keep them below the brine line. Kept refrigerated, these olives will keep at least six months. To serve, spoon some of the olives into a dish and drizzle with fresh extra-virgin olive oil. If you find that the olives are too salty, soak them in water for 4-8 hours before eating. My favorite for flavor, but you must be patient. Place the unwashed, uncut olives in a large vessel such as a fermenting crock, canning jar, of food-safe plastic bucket. Discard any olives that are bruised or misshapen. Make a brine using the following formula: for every half gallon of water, add 1 cup distilled white vinegar and 3/4 cup kosher salt. Make enough brine to cover the olives completely by at least 2 inches. Weight the olives to keep them all submerged in the brine. Keep the olives in a cool place away from sunlight. Cover loosely to let air in and keep out insects and debris. Allow the olives to sit and ferment for 3 months. Skim away any scum that forms on the surface as needed. After 3 months, drain the olives, but don’t rinse them. Create a new batch of brine and let the olives sit for another two to three months. Start tasting once a week after two months in the brine. When the level of bitterness has reduced to your liking, it’s time to add flavor. When you’re satisfied with the sweetness of your olives, drain the brine and make a weaker brine: for every half-gallon of water, add 1/2 cup salt and 3/4 cup vinegar. This is also the time to add any flavoring agents: garlic, herbs, etc. Store the olives in their fresh brine in the refrigerator. They will pick up their new flavors after a couple of days. Otherwise, these are ready to eat. Kept covered and cold, these olives will last at least six months. If you find the olives too salty, let them soak in clean water for 4-8 hours before eating. Eat them as-is, or drizzle on fresh herbs, chile flakes, a squeeze of lemon juice, and a drizzle of extra-virgin olive oil. This method is best with late-season dark olives, as they are much less bitter than green unripe olives. In a large all-cotton pillowcase or food bag, layer the unwashed, uncut olives with a large amount of salt; usually twice as much salt by weight. Discard any olives that are bruised or misshapen. Make certain that all of the olives are well-immersed in the salt. Tie up the bag and hang it. Outside, away from animals, is a great place for the bag; know that it will drip, so make put it someplace it won’t make a mess. After one week, stir the contents of the bag. Add more salt to the top if necessary to ensure all of the olives remain fully coated in salt. Repeat this weekly for about four weeks. Taste an olive to see if its sweetness is to your liking. Keep checking the flavor of the olives once a week and adding more salt as needed. Once you like the flavor of the salt, it’s time to cure them for long-term storage. Rinse the olive of all of their salt. The olives will be quite shriveled and dry. If you like them this way, proceed to the next step. If you’d like your olives to plump up a bit and be less salty, boil them in fresh water for 3-5 minutes. Drain them well and dry them thoroughly between kitchen towels until dry. Pack the olives tightly into jars, then cover with extra-virgin olive oil. Cover and store in the refrigerator for at least six months. Eat them as-is, or cook with them in soups and stews.